Notice how there are no payments scheduled for Credit Card #1 in January and all of the extra snowball payments are being applied to Credit Card #2. The reason for this is the due date on Credit Card #1 which was set to Feb 14. The website thinks that it has all of your $1,000 budget to work with for January and is applying it to all of the accounts with January payments still due. Undebt.it doesn’t know that you have already paid off the full amount planned for Credit Card #1 before setting up your account. To fix this problem the right way, you need to tell Undebt.it that you have already made the payment for January so it is reflected in your monthly budget amount. Go to the debt details page for Credit Card #1 and add a manual transaction for the amount you have already paid. 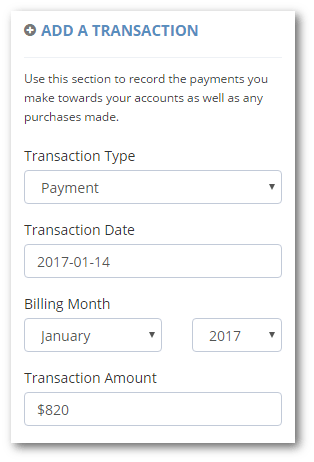 It’s important to choose the correct “Billing Month” when recording transactions because this is how the website tracks what payment goes to what month. Also notice that I paid $820, which is the full snowball amount plus the regular minimum amount due ($785 + $35). Once the payment is saved, go back to the snowball table and see what our plan looks like now. That looks much better now…you can see that the $820 is showing in blue for Credit Card #1 meaning that the payment has been applied to the current month. The empty space above the $820 means that there is no further payment due for the account. The only other payments due for the month are for the minimum amounts due only; $70 & $110. The “Total Payments” column on the far right shows the total of what you still need to pay in black ($180) and what you have already paid in blue ($820). This article used a very simple example to get the point across, but you can make partial payments and it will still work fine. If I would have recorded a payment of $200 instead of the full $820, you would see $620 as the scheduled payment and $200 as the payment made for January. Also, if you get the billing month or amount wrong, just delete it and add it back in; it’s not going to hurt anything. Thanks for using Undebt.it; I hope it’s useful to you and that you’ll share it with your friends. I really needed this post about a week before you posted it. However, it all looks much better now.